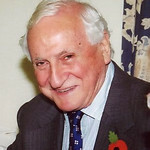 British bridge has suffered a sad loss with the death of Richard Anthony Priday, the last survivor of the 20 glory years that followed the end of World War 2. Educated at Winchester, Tony Priday served in the King’s Royal Rifle Corps during the War, rising to the rank of Major. Subsequently, he joined the family timber importing business and ultimately became its managing director. I well recall trying to contact him by telephone and being told “Mr Tony’s gone down the yard and once Mr Tony goes down the yard, you don’t know how long he’s going to be”. Having learned to play bridge at his preparatory school, Tony came to prominence in the early 1950s in partnership with Charles Tatham. Apparently, the partnership was familiarly referred to in London circles as Thursday and Friday. Tony subsequently had a successful partnership with Jeremy Flint but – somewhat surprisingly in view of his later achievements - was not selected to play in a European Championship until 1961. Great Britain won the event that year and, in Harold Franklin’s view, Tony and his partner (Alan Truscott) were “the most reliable pair on show”. Shortly afterwards, Truscott emigrated and Tony partnered one of the true greats of the game, Maurice Harrison-Gray. Their successes included being selected for the 1966 European Championship and winning the Gold Cup in 1967 and 1968. Writing in his introduction to The Country Life Book of Bridge, Jack Marx opined: “Tony … had become second only to “Skid” Simon as a favourite partner”. After Gray’s death, Tony started to play with Claude Rodrigue. The 1970s were a golden decade for the partnership since Tony and Claude were selected to play in nine consecutive major international championships, an unprecedented achievement in this country. Tony came out of retirement in 2002 and played in the Camrose, 47 years after his first appearance, and also played in Senior events with Bernard Teltscher: when they last played, their combined age was well over 180. Besides being a great player, Tony was a distinguished non-playing captain. Perhaps his greatest achievement was in 1987: Britain qualified for the Bermuda Bowl by virtue of finishing second in that year’s European Championship and lost a close final to the USA. With 10 of the 11 sets played, it was anyone’s match, but the Americans – particularly Chip Martel and Lew Stansby – finished the stronger. Tony gave generously of his time to the EBU. He was a selector for 31 years, being Chairman for 12 of these, and also served on the Laws & Ethics Committee. After ceasing to be an elected member of the Selection Committee, he frequently attended meetings as a Vice-President. When I was the committee’s Chairman, I came to value his experience, knowledge of the players and wise counsel. As well as a player and administrator, Tony was a long-serving bridge journalist, having been appointed the Sunday Telegraph’s first columnist and holding the post for 36 years until being succeeded – in controversial circumstances – by Tony Forrester. Tony will be remembered for his gentlemanly attitude as much as for his great ability at the game. The 1961 European Championship was held in Torquay: two ladies staying at the tournament hotel noticed him passing and one of them remarked what a nice man he was – the other agreed and said that she had been really surprised when she learned that he was one of the bridge players! Tony is survived by his second wife, Vivian, his first wife (Jane) having predeceased him. I learnt to play bridge at Seaford Preparatory School, aged 11. After Winchester, I joined the King's Royal Rifle Corps, where I rose to the rank of Major. In 1947, I joined the family timber business, Sydney Priday & Snewin Ltd, rising to Managing Director in 1968 before retiring in 2001. I was an independent assessor of the technical evidence at the year-long British Bridge League inquiry into allegations of cheating at the 1965 World Championships by Terence Reese and Boris Schapiro. In 1966, I married Jane Juan (d. 1994) and have been happily married to Vivian since 1995. A video obituary is available here.